Over the last several weeks, Seth and I have been listening to a podcast during our morning car ride into downtown. It's just enough time for the entire podcast (20-25 mins) depending on traffic and it's a nice way to sort of forget that you're headed to icky ole work. I'll have to give the credit to my hubby for getting me hooked on the podcast, he told me about it and it sounded interesting and we've been listening together ever since. 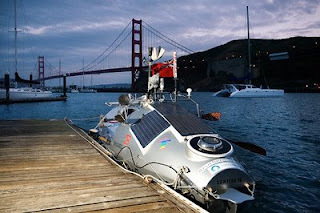 The podcast is "Roz rows the Pacific" with Leo Laporte. The entire episode consists of Leo calling Roz Savage on her satellite phone and they chat about Roz's progress. 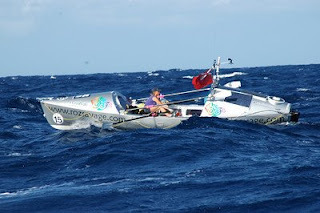 The interesting part is that Roz is currently engaged in an ocean row across the Pacific Ocean - solo. 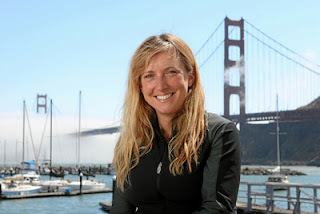 She's rowed the Atlantic Ocean and this is her second attempt to row the Pacific. So far, she's doing way better than her first attempt which ended 100 miles off the California coast in an air-lift rescue by the US Coast Guard. She was OK, but her boat has capsized 3 times in 24 hours and someone called the USCG on her behalf (I don't think she was appreciative as she didn't want to be rescued so quickly). Anyway - during the podcast we get updates on her progress - although all of her info is on her website, she just talks about it on the show as well - she talks about books she's listening to from audible.com, and she discusses ocean conditions, maintenance issues and other things that folks are generally curious about when they think of an ocean row (like how she goes to the bathroom). It's the most amazing thing - this woman is so calm and together and you'd think you were talking to someone who was just away on vacation having a blast. She doesn't come across stressed and has a really great attitude about everything going on aboard her tiny vessel. Of course, she puts on a little for the podcast and admits to more dark and serious emotions and outbursts when she's on the boat, but in general she seems to understand her situation and the realities of being alone at sea. She's got great insight into life and it helps to listen to her speak of her own experiences and life lessons learned. You can check out Roz's website at RozSavage.com. I highly recommend her blog for those who need a cure for boredom. It's addictive. Below is a picture of Roz's row boat on the night of her 2008 launch. 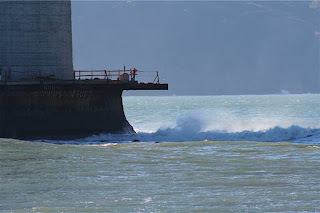 She left San Francisco at midnight and it took her an hour just to get under the Golden Gate Bridge - having been there, I can understand what took so long to get out of the bay - the Pacific comes rolling into the bay like crazy right under the bridge, also pictured below.